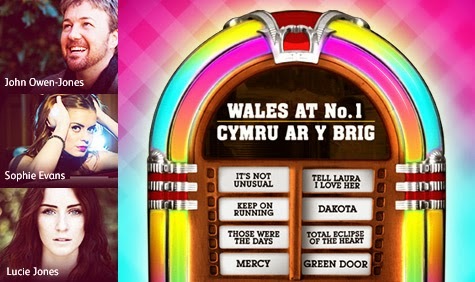 To celebrate St David's Day nextmonth, Wales Millennium Centre is hosting a Concert Called Wales No 1 presented by the One Show's Alex Jones and featuring West End performers John Owen-Jones, Lucie Jones, Sophie Evans with Balsamo Deighton, Alys Williams, Shaheen Jafargoli, Jessica Lee Morgan and Gabrielle Murphy with special guest Ricky Valance accompanied by With the Welsh Pops Orchestra featuring Gwilym Simcock, conducted by Matthew Brind. It will be held Donald Gordon Theatre at 7:30 pm on 1st March. The concert charts over 50 years of rock and pop favourites with a Welsh flavour, and some special arrangements of hit songs that have taken the music and the stars of Wales around the world over the decades.uncluding tracks made famous by Dame Shirley Bassey, Ricky Valance, Spencer Davis Group, Mary Hopkin, Dave Edmunds, Shakin' Stevens, Bonnie Tyler, The Flying Pickets, Manic Street Preachers, Stereophonics, Duffy, and of course Sir Tom Jones – whose huge hit, It’s Not Unusual, celebrates its 50th birthday this year.